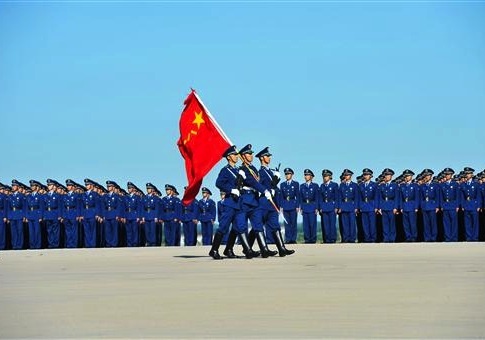 China’s decades-long buildup of strategic and conventional military forces is shifting the balance of power in Asia in Beijing’s favor and increasing the risk of a conflict, according to a forthcoming report by a congressional China commission. China’s military has greatly expanded its air and naval forces and is sharply increasing its missile forces, even while adopting a more hostile posture against the United States and regional allies in Asia, states a late draft of the annual report of the bipartisan U.S.-China Economic and Security Review Commission. As a result, "the potential for security miscalculation in the region is rising," the report said, using the euphemism for a conflict or shootout between Chinese forces and U.S. forces or those of its regional allies. The report paints an alarming picture of China’s growing aggressiveness and expanding power, including development of two new stealth jets, the first deployment of a naval expeditionary amphibious group to the Indian Ocean, and aerial bombing exercises held in Kazakhstan. China’s communist government also views the United States as its main adversary—despite strong trade and financial links between the two countries, the report says. The commission report—to be released in final form in November—concludes that the war-footing-like buildup by the People’s Liberation Army is increasing the risk that a conflict will break out between the United States and China. With declining U.S. defense spending and cuts in forces, the balance of power in Asia "is shifting in China’s favor," the report says. The report warns that China’s communist leaders are fueling nationalist tensions amid concerns about declining economic growth and increasing social unrest. "Promoting a sense of grievance among the Chinese people and creating diversionary tensions in the region would carry real risks of escalation and create the potential for the United States to be drawn into a regional conflict," the report says. The high-technology weapons and other capabilities China is fielding also pose a growing threat to America’s ability to deter regional conflicts, defend allies and maintain open and secure air and sea-lanes. As China builds up its naval power, the U.S. Navy is declining, and the current American ability to defeat China in a conflict will be difficult to maintain, the report says. By 2020, China is expected to have 342 submarines and missile-firing warships deployed, many of them equipped with advanced weapons. By comparison, the total U.S. naval forces will be 243 ships and submarines in 2020. Fisher credits the commission for highlighting the shift in the balance of power that he said is linked to China’s growth in air and space power. "The regional balance of power shift in China’s favor is based on well documented analysis and should be required reading for anyone concerned with China's growing ability to threaten U.S. interests in Asia," he said. A super fast strike vehicle that glides to its targets of speeds of up to nearly 8,000 miles per hour could be deployed by 2020 and a similar high-speed scramjet powered hypersonic attack vehicle could be fielded before 2025, the report says. "Hypersonic glide vehicles could render existing U.S. missile defense systems less effective and potentially obsolete," the report says. On China’s strategic nuclear buildup, the report identifies China’s large-scale buildup of both conventional and nuclear-armed missiles as a serious threat. China’s has as many as 1,895 ballistic and cruise missiles, including up to 1,200 short-range missiles, up to 100 medium-range missiles, up to 20 intermediate-range missiles, up to 75 intercontinental missiles, and up to 500 ground-launched land attack cruise missiles. The Pentagon after 2010 halted releasing annual assessments of Chinese missile forces that one expert said undercuts the Obama administration’s policy of seeking a more open Chinese military by "indirectly assisting Chinese secrecy." For targeting U.S. forces in Japan and South Korea, China has deployed DF-21C theater-range missiles with ranges of about 1,240 miles and appears to have developed a second system, the DF-16. Its new intermediate-range missile, to be deployed in the next five years, will be able to hit U.S. forces on Guam, Northern Australia, Alaska, and U.S. forces in the Middle East and Indian Ocean. China’s nuclear strike forces remain couched in secrecy, the report said. "China’s official statements about its nuclear forces and nuclear capabilities are rare and vague in order to maintain ‘strategic ambiguity,’" the report says. The commission report faults the Pentagon for ending its practice of providing details of China’s nuclear arsenal in annual reports to Congress, saying the omission is contributing to Chinese military secrecy. The Pentagon has not released an assessment of Chinese nuclear forces since 2006 when it said China had more than 100 warheads. Current estimates by non-government analysts place the number of Chinese nuclear warheads as from 250 to as many as 3,000. "Despite the uncertainty surrounding China’s stockpiles of nuclear missiles and nuclear warheads, it is clear that China’s nuclear forces over the next three to five years will expand considerably and become more lethal and survivable with the fielding of additional road-mobile nuclear missiles; the integration of as many as five [Jin-class missile submarines], each of which can carry 12 JL-2 submarine-launched ballistic missiles; and the introduction of intercontinental ballistic missiles armed with multiple independently targetable reentry vehicles," the report says. The newest system is the DF-41 ICBM that is expected to be deployed as early as next year with up to 10 multiple nuclear warheads. The DF-41’s range of about 7,456 miles is sufficient "to target the entire continental United States," the report states. The report also includes the graphic published in China’s state-run Global Times in November revealing that a Chinese submarine-launched ballistic missile attack on the United States could kill 5 million to 12 million people. China’s space warfare programs also are expanding significantly, according to the report. "The PLA is pursuing a broad counterspace program to challenge U.S. information superiority in a conflict and disrupt or destroy U.S. satellites if necessary," the report said. "China likely will be able to hold at risk U.S. national security satellites in every orbital regime in the next five to ten years," the report says. The commission also wants Congress to direct the Pentagon to provide more details on China’s conventional and nuclear missiles and warheads. On China’s cyber espionage activities, the report said China’s government has been engaged in "large-scale" cyber attacks against U.S. networks, including defense and private company systems. Among the data stolen by Chinese hackers were details of U.S. weapons systems including Patriot anti-missile defenses, the F-35 and F-18 jets, P-8 reconnaissance aircraft, Global Hawk drones, Black Hawk helicopters, Aegis ballistic missile defenses, and the Littoral Combat ship. "In addition to stealing the designs of these weapon systems and technologies, China’s cyber actors targeted internal communications, program schedules, meeting minutes, and human resource records, among other documents," the report said. "China’s material incentives for continuing this activity are immense and unlikely to be altered by small-scale U.S. actions," the report says. Chinese President Xi Jinping has made China’s missile forces the "core strength" strategic deterrence. A U.S. defense analyst said China’s efficient defense spending could render U.S. aircraft carriers difficult to defend. China could build 1,127 DF-21D anti-ship ballistic missiles for the cost of one U.S. aircraft carrier at $13.5 billion. The report includes sections on China’s domestic stability, security, foreign affairs, North Korea, economy, trade, energy, and health care. It is produced annually by the commission, currently headed by Chairman Dennis Shea, a lawyer and former government official, and Vice Chairman William Reinsch, a former Clinton administration Commerce official. The commission’s final report is expected to have only minor changes from the draft, a commission official said.